Valentine's Day. Two words that leave people in a hot flush, or a cold sweat. The pressure of finding the perfect gift, arranging the perfect dinner or just getting the card right for the person you fancy can be, well, challenging (unbearable). Usually I'm rushing around at the last minute, eventually picking up a favourite bottle of bubbles for my Sar before we settle into a romantic picnic together somewhere. Of course, this year, we'll be joined by our boys, Captain Morgan and Baby Rhett, and the trampoline in the backyard will most likely be the 'romantic' spot. So, if, like me, you don't succumb to the commercialisation of February 14 but still want to acknowledge it with a stylish but not excessive hat-tip to Saint Valentine, here's what you do this year: promise that special someone - him or her - some real action! Of course, I'm referring to action of the armchair variety. Because, clearly, after wining and dining your muse, you'll be looking forward to a rip-roaring action thriller... right? Set the scene: table, candles, music, rose in vase, etc. Then, just as you're pouring the bubbly, gently place Defender: Intrepid 1 on your muse's place-mat and announce that tonight, they get Alex Morgan / Arena Halls / Victor Lundt on a plate (depending on their preferences, of course). Create a playlist for the evening - kicking things off with Dance Me To The End Of Love by Madeline Peyroux (Arena Halls would be proud of you) and then suggest that you each do an interpretive dance to the song that best suits your mood at the time :) I recommend against Til The End by The Living End, even though Alex Morgan would be happy, not such a good pick for Feb 14... unless you want to end up with whiplash! (Just incidentally, both these songs appear in Defender: Intrepid 1 ). 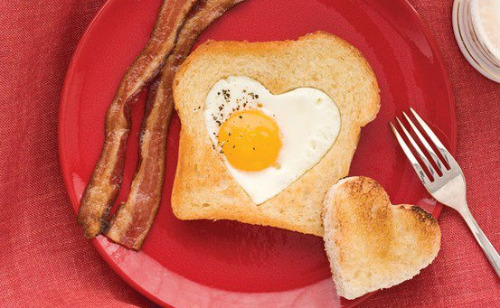 Nothing says romance like heart shaped foods, I've always thought, and turns out everyone on Pinterest agrees! I particularly like this tasty morsel - such a sophisticated take on bacon and eggs - and it would go down a treat with the Mr or Mrs at dinner. Perhaps more so with the Mr than the Mrs. Anyway, simple is best and you can spend the all time you saved washing pots and pans doing something a little more intimate... like reading Hunter: Intrepid 2 aloud to each other. Now, it just wouldn't be very Intrepid-esque to leave your options at just dinner and dancing. Why not draw a decadent bubble bath for your muse. Don't leave anything to chance: candles, flowers, music - perhaps something classical that would appeal to Charlotte-Rose Fleming, you get the idea. You're all set so, when your loved one desires, guide them into the water, close the door, then pad back down the hallway, pour yourself a healthy Shiraz and sneak in a few more chapters of Alex Morgan's latest, allowing your muse a few precious moments to soak. Perhaps you're more of an outdoorsy type. No problem. Everyone loves the moon, especially when it's full. So, why not serve a nice dessert wine and cheese platter outside? Then, to maximise your time, pre-arrange for head-mounted flash lights so that you don't miss out on a good reading session once the sun does go down and the cheese platter is all gone. I mean, seriously, what else would you do? Finally, for those with an exhibitionist streak, there's always the chance to Show Us Your Thriller. Why not choose just the right moment during the course of your romantic evening together and pose with your copy of Defender or Hunter - or both - maybe even acting out one of the scenes described above. Post it onto my Facebook page - then, after a popular vote, one lucky person will be immortalised with a character in my next adventure story: AVENGER: Intrepid 3! Now that you and your muse are guaranteed a thrilling time on February 14, here's how to make it a sure thing. 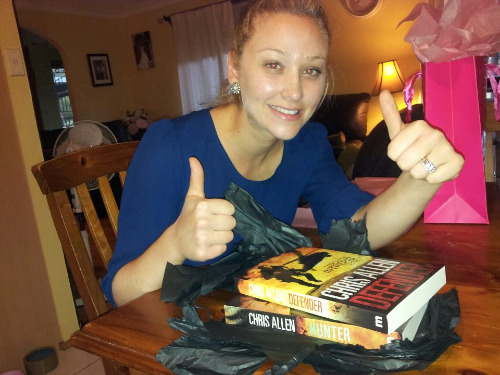 Of course, I'm talking about an inscribed, signed, bookmarked and beautifully wrapped copy of Defender and Hunter for $40 plus $12 postage Australia-wide. Or you can get Hunter for $25, Defender for $20 plus the same postage cost. If you prefer, you can give the gift of an eBook to your loved one and it's dead easy to do on Amazon if your girl or guy has a Kindle. Just go to the page for Defender on Amazon or Hunter on Amazon and select the 'give as gift' option. Our good mates at Momentum Books have also written this blow-by-blow account on how to gift eBooks to other people with all types of eReaders, helpfully titled The Lazy Person's Guide to Gift Giving. If that doesn't make you feel good about yourself, I don't know what does. There you have it, folks. Oh, I forgot to mention - signed copies are best for Australia-wide only, otherwise the postage gets ridiculous; download an order form here then email your completed forms to gday@intrepidallen.com; and last drinks (orders) are due by this Sunday evening 10 February so we can get them delivered by Thursday. Let's make your next Valentine's Day the most thrilling yet: full steam ahead.